If your friends describe you as “attracted to slightly morbid curiosities or fond of meat”: this spot is for you! The restaurant is located right across Gate No1 of Vienna’s biggest cemetery Zentralfriedhof, which by the way is the world seventh largest cemetery and “last home” to about 3 million people. This is where you should hop off tram 71 if you want to start your walk at the Jewish cemetery. To me, walking up and down its paths is a quiet highlight in Vienna. You can also bring your vegetarian friends to Concordia Schlössl; it’s just that the choice for them is not exactly huge. For all nonvegetarians: I recommend you go for a Wiener Schnitzel! Variations of the typical Austrian dish here are curious, nonetheless delicious. They serve most of them rolled-up, stuffed with various fillings and with salad. The stuffing might seem strange to you, yet the chefs have thought it through, and their creations do in fact taste very good. On the menu, one reads odd names, and there is even a popcorn-Schnitzel. One more weird thing around here: the prices. Numbers are € 11.88 or € 14.91. The reason is, they converted the prices when Austria’s former currency Schilling was replaced by the Euro and didn’t bother setting round figures. 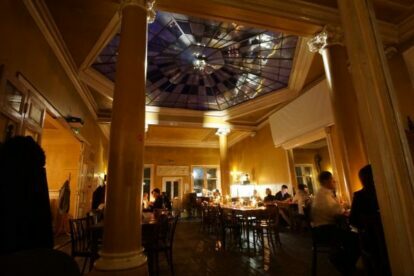 Also, Concordia Schlössl is a hot tip for nice atmosphere dining, with soft light and old wooden floor it sets for a romantic candlelight dinner. For pure romance enjoy one of their live Jazz/Blues sessions or get married here!